It all comes down to this. 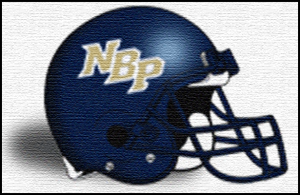 North Broward Prep (6-3 overall, 2-3 in conference play) and Key West (5-4, 4-1) will face off in the Gold Coast Conference semi-final playoffs this Friday night in Key West. Jesse Nadelman, a student at North Broward Prep who covers the Eagles for FloridaHSFootball, and Jason Beede, a student at Key West High School who covers the Conchs for FloridaHSFootball, break down this week’s do or die playoff showdown in the southernmost point in the United States. We’ve seen in it over and over again: the dominance of Mekhi Sargent. Through nine games, the senior has rushed for 1,536 total yards which puts him at 14th in the state of Florida for rushing yards. When the teams last played, Sargent rushed for 201 yards and three touchdowns, on only 17 carries. Even last year when the Conchs defeated the Eagles 56-14 on September 19th, 2014, Sargent rushed for 160 yards and 3 touchdowns, carrying the ball only six times. Mekhi Sargent isn’t the only reason, the Conchs have the upperhand when running. The Conchs triple option offense has produced 3,065 rushing yards overall this season, averaging 340.5 yards per game. Sophomores Alvin Howard and Kolby Kelleher both have had successful seasons running the ball as well. Howard has rushed for 383 yards, while Kelleher has 579 yards. North Broward Prep gave up a 56 yard touchdown to Kelleher last time the teams played and another 54 yard explosion to Sargent. In their last meeting, the Conchs crushed the Eagles defense, rushing for 431 yards and a total of 5 touchdowns. 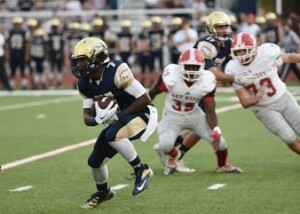 Key West will most definitely continue to control the running game against North Broward Prep on Friday night. Like Jason said, Mekhi Sargent is an absolute beast. As we saw on September 18th when North Broward clashed with the Conchs, Sargent didn’t even have what he would consider a great game, yet he mustered over 200 yards and three touchdowns. The Eagles also gave up a long rushing touchdown to Kolby Kelleher in that game, depicting how the North Broward defensive line really struggled with the size and toughness that the Conchs offensive line brings to the table. North Broward was upset last week by Pembroke Pines, who runs the read-option, so a bigger and more talented Key West rushing attack should definitely dominate the Eagles on Friday. Eagles’ running back Dymitri McKenzie carries the ball against Key West when the two teams played back on September 18th. To win, the Conchs almost want North Broward to run the ball. 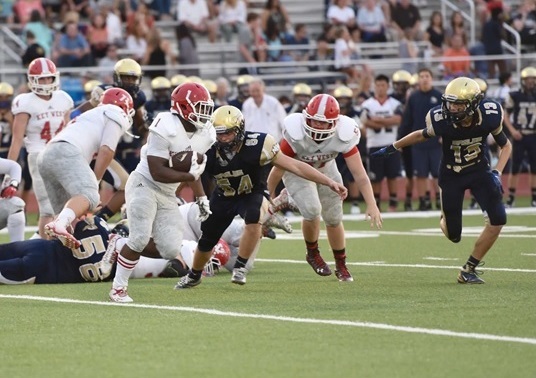 The size of the defensive line for Key West is much larger than the Eagles offensive line and it was evident last game as the Conchs were able to hold North Broward Prep to under 40 rushing yards. The more the Eagles run, the less C.J. Riley and Kevin Austin catch the ball for the Eagles. North Broward Prep is a passing team and Key West’s secondary is not nearly as talented as the star studded wide receivers of North Broward. The Conchs are very capable of stopping the Eagles’ running game and I expect them to do so. However, if North Broward Prep wants to upset Key West, the Eagles must develop some sort of running game against the Conchs bulkier D-Line. This, in my opinion, is what the game will come down to. In all of North Broward’s losses this season, the Eagles have rushed for under 100 yards, failing to establish a run game. However, in all but one of the Eagles’ wins, junior Dymitri McKenzie has rushed for over 100 yards. When these two teams faced off in September, it was the Conchs’ size on the offensive and defensive lines that were the difference, and they held McKenzie to under 30 rushing yards in that contest. It should be vital for offensive coordinator Derrick Mayes to try and establish the run game early in this one to keep the ball out of Mekhi Sargent and the Conchs’ offense’s hands, but he can only call the plays. I expect the Key West defensive line to overpower the stingy Eagles’ offensive line, which may leave McKenzie and senior Andres Sierra with minimal if not no room to run. However, we shall see what kind of gameplan Coach Rex Nottage, a former offensive lineman, has for his O-Line this Friday. Key West sophomore Michael Cleaver releases the ball quickly before getting hit by Archbishop McCarthy defender on October 16th at home. Let’s face it, the Conchs barely pass the ball. Thanks to a strong secondary, North Broward Prep has intercepted the ball 11 times this season, including a pick six in the 3rd quarter from sophomore Logan Shooster last time the two teams faced off. 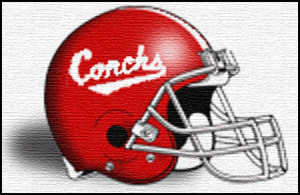 The Conchs have 39 rushing touchdowns this year, compared to only 12 passing touchdowns. As Jesse points out below, the Conchs typically have success passing the ball late in the game when Key West has a big lead. If junior Dymitri McKenzie and senior Raymond Maldonado can keep the pressure on Key West quarterback Michael Cleaver and force turnovers, then North Broward Prep should control the passing game. Of course, the Eagles must watch out for trick plays and half back passes from sophomore Alvin Howard. Rarely will you see Key West pass the ball, so instead the Eagles should focus on stopping the Conchs aggressive running game. The Conchs have literally no passing attack what-so-ever. That is why if teams are able to limit the Key West rushing attack (something that has shown to be almost impossible), it’s easy to beat them. But Key West averages just 68 passing yards per game this season, a number that is inflated from blowout wins in which the Conchs threw towards the end of the game. 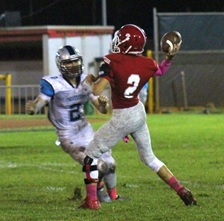 Junior Michael Cleaver is a total run first quarterback, and when the Conchs and Eagles faced off earlier this year, their passing attack did absolutely nothing besides a wide open touchdown at the end of the first half, in which no North Broward defender was even within 20 yards of the Conch receiver–a rare blown coverage by the Eagles. A strong North Broward linebacker core and secondary should lock down a lackluster Key West passing game. Four touchdowns, 270 yards, and only a single interception. That’s what senior David Vozzola put up against the Conchs way back on the night of September 18th. Vozzola will most likely have similar numbers this Friday as the Conchs have been unable to find a solution when stopping the passing game, only having two interceptions this season. I’m not even going to bring up the monstrous receiving core that North Broward Prep has between senior C.J. Riley and sophomore Kevin Austin. I’ll let Jesse do that. 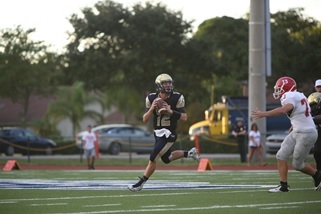 Not to mention, North Broward Prep is averaging over 234 passing yard per game. If the Conchs want to keep the ball out of the hands of Riley and Austin, they must control the clock and slow down the game by running the ball. No matter what, North Broward will pass the ball and will continue to find success. Another key factor in the game for the Eagles here. It’s no secret that North Broward sports the two best receivers in the conference–if not two of the best receivers in their class in Florida–in 6’5” C.J. Riley and 6’3” Kevin Austin. Not to mention the return of 6’2” tight end Kenny Henningsen, quarterback David Vozzola has plenty of targets to throw to. The Eagles racked up 270 passing yards and four touchdowns against Key West in September with Austin catching three TDs alone. It’s clear the Conchs put all of their defensive focus on three-star C.J. Riley, but forgot about his fellow stud Austin. Key West’s coaching staff must formulate a gameplan to contain these two receivers, who have combined for 1,568 yards and 22 touchdowns this season. However, teams have tried to form a gameplan, but have failed. Austin and Riley need to dominate this game like they can to match the points the Conchs’ rushing game will put up. The Conchs have found success behind kicker Mark Robino on special teams. The former soccer player has been nearly perfect on points-after-touchdown (PATs), completing 16 out of 18 attempts so far this season. When they aren’t kicking PATs, Key West is simply handing the ball off to Mekhi Sargent or Alvin Howard to bring it home for a two-point conversion. The robust Sargent and the rest of the Conchs’ halfbacks have combined for 17 two-point conversions, compared to North Broward Prep’s nine conversions this season. Although the kickoffs have not been the greatest, Robino has been improving over the last couple games. If the Conchs score, Robino will nail the kick most of the time. Both teams haven’t been pretty with special teams this season so I think whoever can be less sloppy will win the game. Ugly, Ugly, Ugly. That pretty much summarizes North Broward’s special teams this season. From losing starting kicker Andres Del Castillo, to not really finding a solid kicker for kickoffs, the Eagles’ lone bright spot on special teams has been junior running back Dymitri McKenzie as punter. North Broward has shanked many kickoffs this season, setting up teams with great field position. Also, the Eagles don’t really have a field goal kicker which forces them to go for two almost every time they score. North Broward’s special teams has been horrendous this season, and it’s hard to imagine them improving it before Friday’s matchup. Coach Nottage will just have to hope his team avoids killer mistakes on special teams this week. Although this is a revenge game for North Broward Prep, the Key West Conchs will take care of business this Friday night at Tommy Roberts Memorial Stadium. No one really has been able to stop Mekhi Sargent and I don’t expect the Eagles to start now. Between the potent running by Key West and a weak special teams from North Broward Prep, the Conchs should have no problem. Just like last game, it will be close all the way up until the 4th quarter. This is Key West’s second straight year of hosting a playoff game and only their second home postseason game since 1995 so expect a rowdy home crowd. It is important to point out that last week North Broward Prep was upset by Pembroke Pines 34-28. Something to remember: Key West flat out crushed Pembroke Pines 61-7 earlier this season. If senior quarterback David Vozzola wants to pass again in high school football after Friday, the Eagles must try to at least slow down the running game of Sargent and Kelleher and Vozzola must have a big game of his own. However, I expect Key West to come out on top and advance onto the Gold Coast Conference championship game. I truly think this will be a very close game, something many people may not expect after the Eagles lost to lowly Pembroke Pines Charter last week. However, I wrote a column on why North Broward should bounce back this week, because they’ve faced a lot of adversity throughout the season and overcome it. The Eagles are finally nearly at full strength and should be motivated for this game to make a statement. Plus, the offense is extremely talented and I expect both C.J. Riley and Kevin Austin to have monster games in this one. But the difference will be Key West’s size and toughness on the defensive and offensive lines, as Mekhi Sargent should run wild in this one, and the Eagles rushing game will be limited. The Conchs should simply overpower North Broward in that aspect, something they’ve done to many teams this season. Also, playing on the road at a tenacious Key West crowd is not the least easy. I expect Key West to move on, but for North Broward to put up a strong fight. But the Eagles can pull off the upset if they are able to at least limit the Conchs’ rushing attack, and establish a running game of their own. Conclusion: No matter the result, this Gold Coast Conference battle will be one for the ages as both teams are averaging over 30 points per game. If either team wants to advance, they must keep to what they know best as we discussed above. The North Broward Prep Eagles look for another shot against the Key West Conchs in the Gold Coast Conference semi-final playoffs this Friday night while Key West looks to pick up where they left off the last time the two teams clashed. Kickoff is at 7pm under the lights in the Southernmost city. 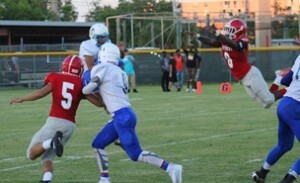 This entry was posted in Key West HS Football, Uncategorized.